Las Vegas mass shooting survivors reunited with their "Route 91 family" night at country singer Jason Aldean's concert, watching the same artist who was performing onstage the moment shots rang out one year ago. (LOS ANGELES) — Las Vegas mass shooting survivors reunited with their “Route 91 family” Saturday night at country singer Jason Aldean’s concert in Orange County, California, watching the same artist who was performing onstage the moment shots rang out one year ago. 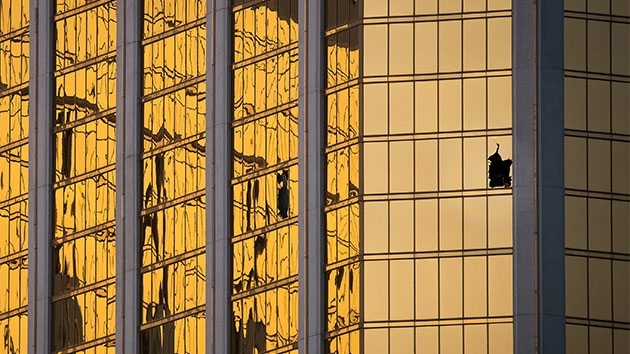 On Oct. 1, 2017, Stephen Paddock opened fire from the 32nd floor of the Mandalay Bay Resort and Casino, spraying hundreds of bullets on concertgoers attending the Route 91 Harvest Music Festival. Paddock then turned one of his guns on himself. Fifty-eight people were killed and hundreds injured in the deadliest shooting in modern U.S. history. This weekend Ingrid Canelo and her daughter Renee Canelo were among the survivors reuniting with fellow concertgoers for the first time since the shooting. “When she grabbed my arm and said, ‘We’ve got to get out of here,’ it was that look of sheer terror on her face,” Ingrid Canelo told ABC News. As the mother and daughter started weaving their way through the crowd, Ingrid Canelo said other concertgoers looked at them as if they were overreacting. The second round of gunshots was when everybody figured out that there was a shooter, and dove to the ground. “It gives me chills right now even thinking about it,” Ingrid Canelo said. In the year since, Renee Canelo said she struggled getting back into daily life and took some time off work. She said it was difficult to be in crowds, and that this reunion is her first concert since the shooting. “To come back and be at Jason Aldean’s concert, it’s extremely terrifying for me. But my will to fight on and fight for love and support my other survivors and commemorate the 58 people who lost their lives is so much more important and powerful than any kind of fear,” she said. Babij was at the festival with his wife and friend when the shooting broke out. He was shot in the shoulder but managed to jump over a fence and take cover, waiting out the entire massacre underneath the soundstage. Danielle Bajhart, another survivor, called it a unique community formed with people she would not have met otherwise.